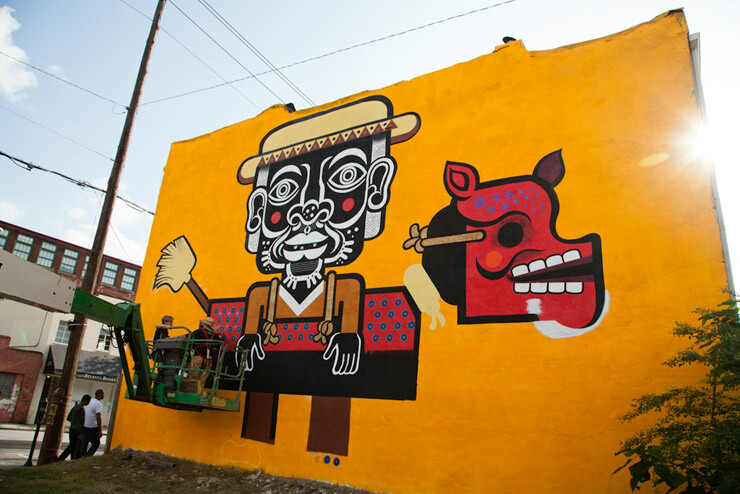 Starting off the week we check in with Living Walls Atlanta for our fourth installment of 2012 and an inspirational installation by a Street Artist and painter from Mexico City named Neuzz. Like species, neighborhoods are named endangered. Places lose their value, their splendor and charm over time as shoddy development moves in. 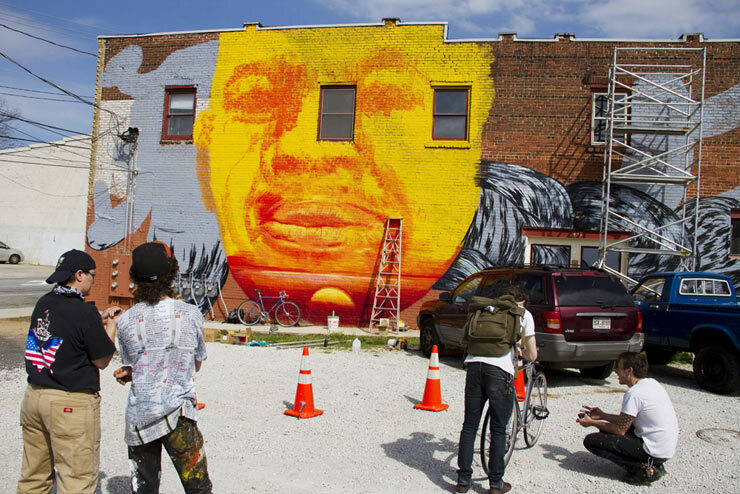 Sweet Auburn District, which was once a lively area decades ago, was recently named one of United States’ most endangered places. The neighborhood that holds Sweet Auburn District, the Old Fourth Ward, has experienced a similar decline. Namely, Edgewood Ave, which is littered with empty buildings and Styrofoam trash. It’s easy to overlook the historic value of the district upon first glance, yet many have measured the significance of O4W in other ways. 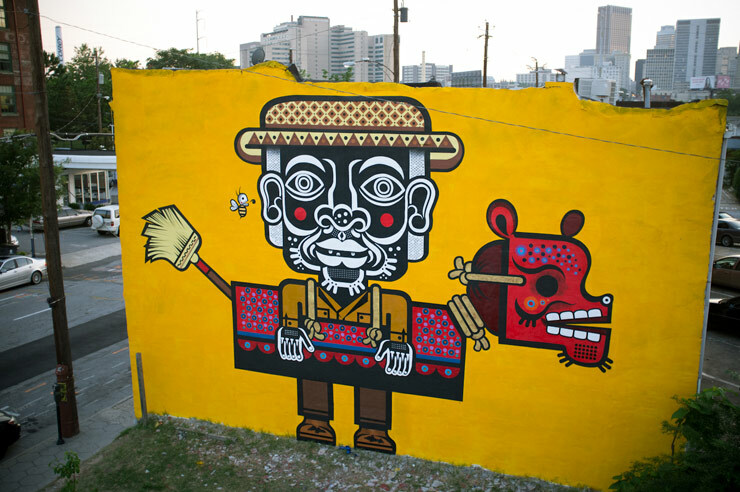 Neuzz, aka Miguel Mejía, came to Atlanta to experience the city of grit that reminds him much of his own, Mexico City. 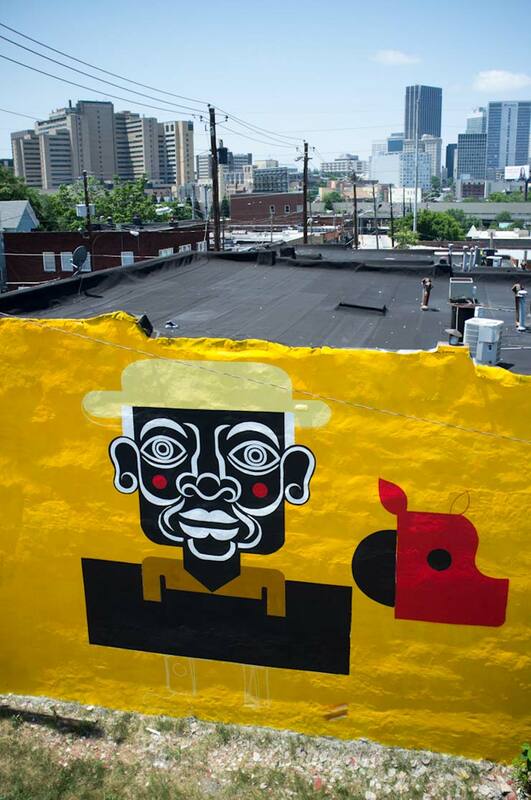 The historical determination of Dr. Martin Luther King Jr. initially attracted Neuzz to Atlanta, where he would complete a wall located in King’s district. 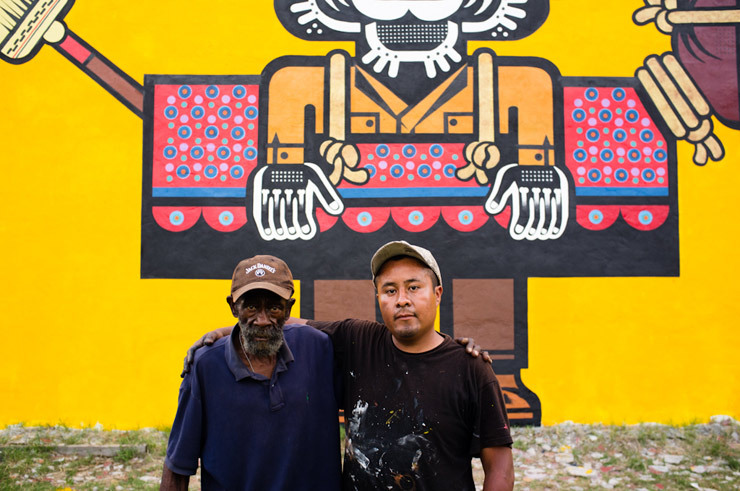 His four week stint allowed him to develop a richer understanding of the area; the social and economic congruence to his home city in Mexico inspired him to transform the “sad wall” into art through his rich, vibrant colors. 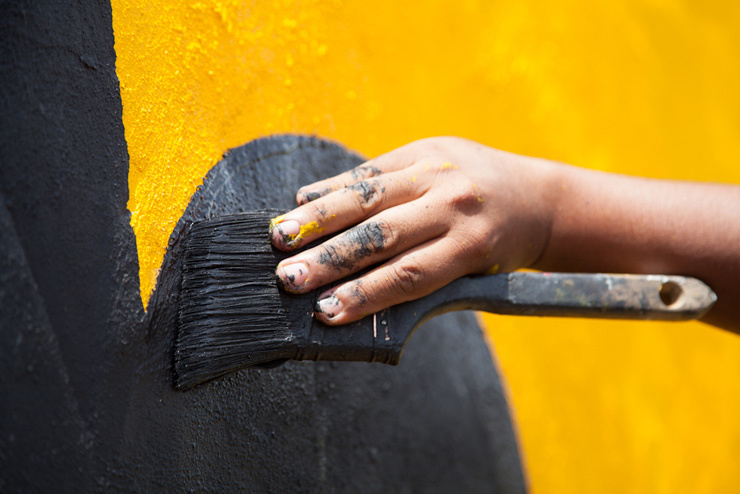 His assistant, Keif Schliefer, guided him through the process of completing his largest mural as of yet. 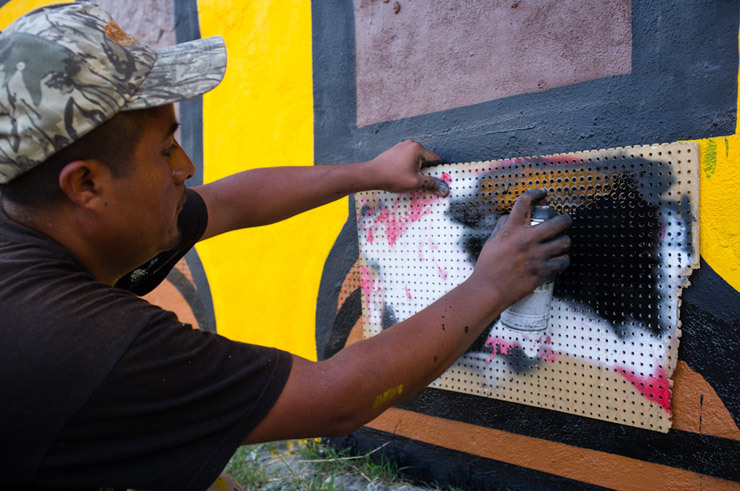 The subject matter and motif of the wall comes from his heritage; his style and methodology is derived from his modern understanding. 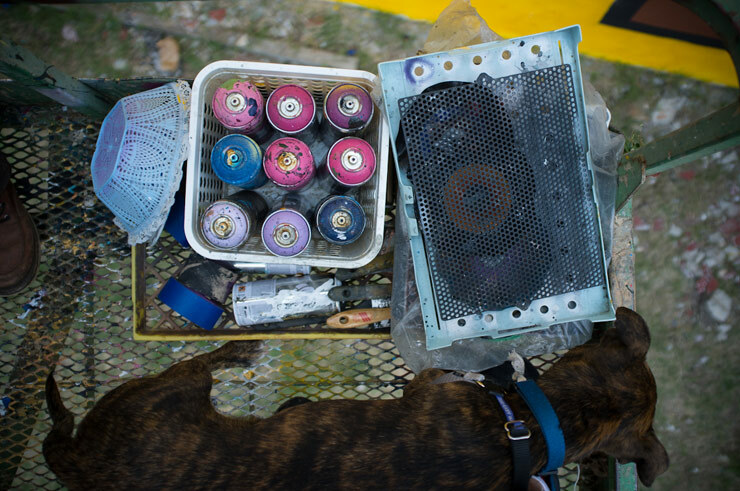 The composition and coloring was entirely influenced by the community – any kind of trash he found, he used as a stencil. 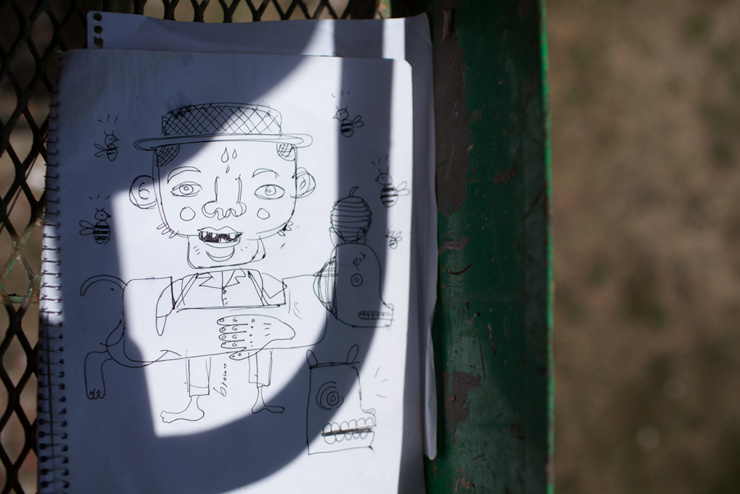 His sketch likened a traditional costume-dance to celebrate rain and agriculture (the very rain that prevented work for five days) and incorporated the bees he handled at Keif’s house. 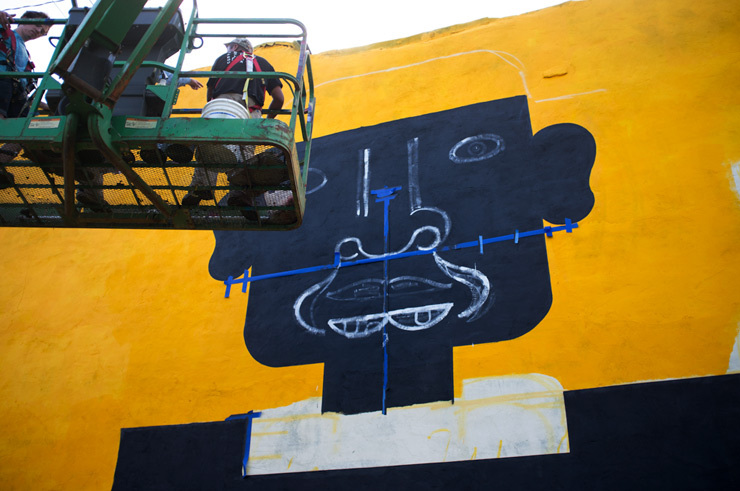 Aside from being an artist, architect, civil rights activist and a former firefighter, Keif is also Living Walls Projects’ Chief Engineer and Logistics Director. Some people grid out their walls while others project, but Neuzz simply laid out a solid base. His work is very symmetrical, yet he entirely relies on his paintbrush and his own hands to serve as his unit of measurement. While he went back and forth on the lift often to ensure proportions, the reward was sweeter in the end – Keif and Miguel developed new techniques, new approaches, that he will take with himself beyond Atlanta. 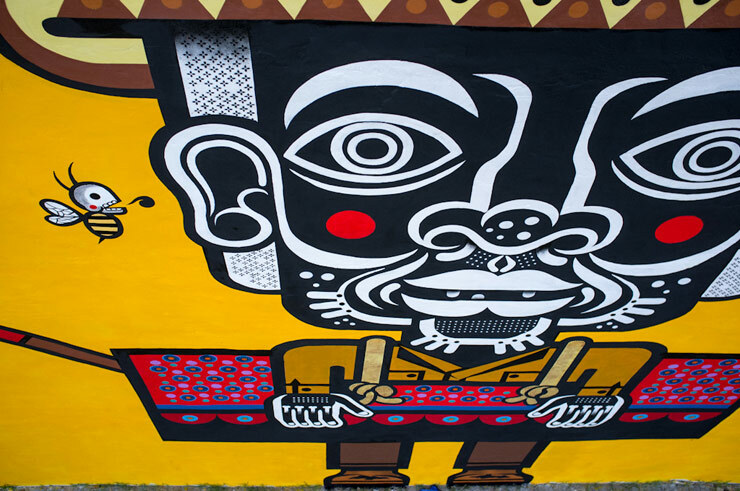 While Neuzz incorporated elements into his wall, the community became stakeholders in the mural. Keif would invite people up onto the lift, where they’d take photos of the wall, the skyline, themselves. While working he’d talk to people, entertain them, learn their stories. Everyone had his or her own experience. Neuzz has the invaluable knack of building relationships despite cultural differences. 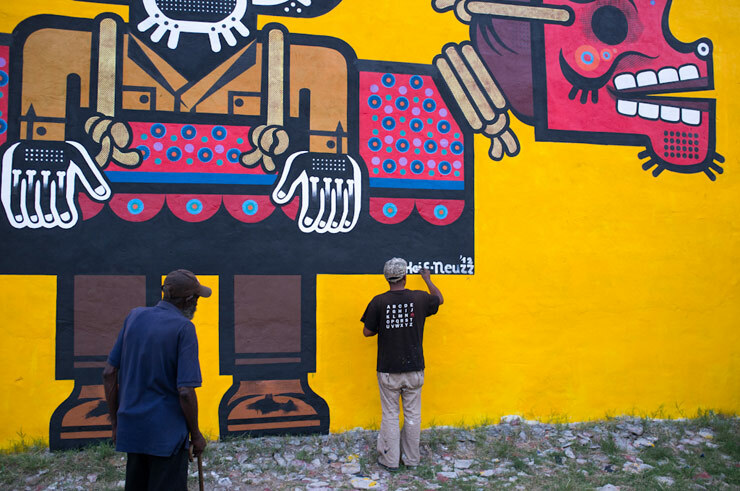 One woman told me as she walked by that the wall offered the area “priceless culture.” As artists like Neuzz continue to donate their time enhancing this endangered area, revitalization will take a new meaning. To learn more about Living Walls Altanta: The City Speaks and to make a donation to help this year’s conference click here. BSA thanks you for supporting this good work.